Once again, Rockstar is absolutely abysmal when it comes to its tutorials. It gets the very first one right, by displaying the prompts on the bottom center of the screen, below the subtitles. That's for the basic movement controls that should be common sense. Once it gets into the more complicated and esoteric stuff that isn't intuitively obvious, it falls back on the tried-and-failed method utilized in Grand Theft Auto V of printing a tutorial prompt in a tiny black box in the top corner of the screen, during the action of the game! 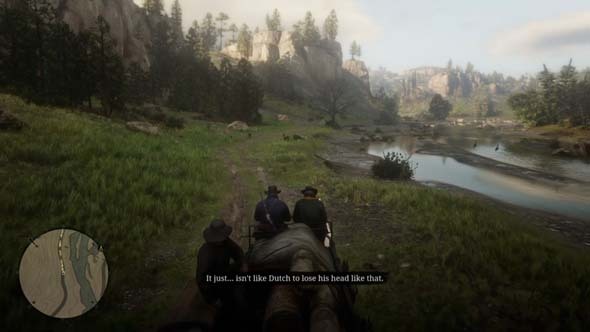 Even if you are lucky enough to notice that there's a tutorial tip while you're in the middle of a horse chase or shootout, it's still hard to read and decipher the tiny text and button icons. There's no option to use a larger font or to rescale the UI if you're playing on a less-than-huge TV. Rockstar, listen, I'm playing the game on a console, from my couch, with a wireless controller, ten or so feet away from a 46-inch TV. I'm not 14 inches from the screen. Use a readable font! often in the middle of an action sequence, in which your attention is on something else. We did buy a much larger TV over Black Friday, so the UI is now much easier to read, and my girlfriend might even go back and play games like Monster Hunter: World and Assassin's Creed: Origins now that the TV is big enough to read the damned text on the screen. It doesn't help that there is no way in-game to review any of the tutorial prompts that you may have missed, nor is there any way to view the controller mapping. There's a "Help" section in the pause menu that does contain a large amount of information, but that only helps if you know what you're looking for. If you couldn't read the tutorial prompt because you were busy in a gunfight or horse chase or whatever, then you're not going to know what you're even supposed to be looking for if you try to look it up. It's like opening up a dictionary, but not knowing what word you're trying to define. The controls for this game are very complicated, with lots of buttons being overloaded to multiple, context-sensitive commands, and with certain commands requiring that you hold multiple buttons. I'm constantly forgetting the controls for fist-fights, and I can never remember the dive/roll button for the life of me. It would be very nice to be able to pause the game and double-check the controls if you're coming back to the game after having not played for a few weeks or months, or if you come across a mechanic that hasn't been tutorialized or practiced yet. It's hard to make out what many of these icons are supposed to represent. This is further exacerbated by the use of tiny icons that are still hard to decipher on the 75-inch TV -- and were impossible to read on the 46-incher. Seriously, if you're playing on anything less than a 60-inch TV, you need hawk eyes to be able to read this stuff! Often, I would see one of the horse icons above my mini-map flash red with some un-discernible icon, and I had no idea what this icon meant. It was over the horse's health icon, and kind of looked like it might be a steak, so I tried feeding the horse, which did nothing. 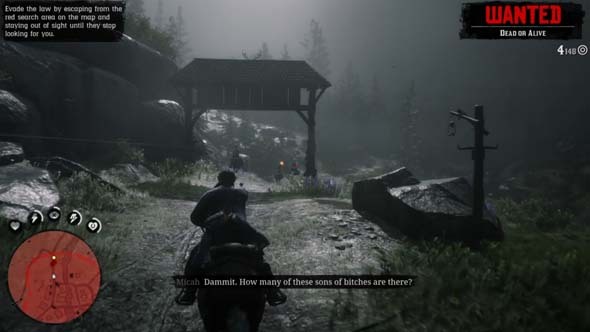 Besides, why would Rockstar use a steak icon to indicate that you need to feed a horse? Horses don't eat steak. After some digging online, I discovered that this icon maybe means that my horse is dirty, and I need to brush her or run her through water to clean her. Similarly, in base camp, there are three icons in the top right corner that are tiny and un-discernible. They are supposed to represent the camps supplies: food, medicine, and ammunition (I think), but damn if I could tell which one is which. The glut of articles and forum topics explaining just what these icons mean tells me that I'm not the only one who had this problem. Once you get through the tutorials and start playing the game proper, you'll be rewarded with a massive, immaculately-detailed, and well-realized world that feels like a living, breathing place. Unlike many other open world games and RPGs, Red Dead Redemption 2's simulationist design truly provides a feeling of living within this world. There's a bevy of context-sensitive animations that make everything feel so organic and life-like, and which really help to immerse the player in this gritty, realistic setting. The game world is immaculately constructed and detailed.